The state’s education commissioner proposed a set of regulations yesterday that would radically overhaul the way teachers and administrators are evaluated, making student MCAS results central to judging their performance. The proposed regulations would reward teachers and administrators whose students show more than a year’s worth of growth in proficiency under the Massachusetts Comprehensive Assessment System and on other exams, while educators whose students underperform would be placed on one-year “improvement plans.’’ Under the proposal, teachers could face termination if they do not demonstrate progress. The goal is to fix a long-broken evaluation system that too often fails to provide constructive feedback to educators on how they need to improve and on what they are doing right, Mitchell Chester, the state’s commissioner of elementary and secondary education, said in an interview. Evaluating teachers and principals has become a focal point for the state as it tries to reduce high school dropout rates and turn around dozens of failing schools. If done correctly, state officials, business leaders, and educators believe, the job reviews could help advance the academic fortunes of a whole classroom of students or even an entire school. The overhaul would require approval from the state Board of Elementary and Secondary Education, which is expected to vote on it in June after a two-month public comment period concludes. Districts would then have two to three years to implement the new evaluation system, a process that will require district leaders to negotiate the changes with local unions. That raises questions about whether the system could be watered down in some districts or whether some unions would legally contest the state’s authority to impose such a major change. The Massachusetts Teachers Association, the state’s largest teachers union, supports using MCAS and other testing data in evaluations, to the dismay of some local affiliates. The association was still reviewing the proposed regulations yesterday. Paul Toner, the association’s president, said he and his staff will be seeking clarification on some provisions, such as exactly how student test scores will be used in teacher evaluations, as well as how long teachers will be given to show improvement. Tom Gosnell — president of the American Federation of Teachers Massachusetts, which includes Boston teachers — reiterated the federation’s longstanding opposition to using MCAS scores in teacher evaluations and declined to comment on the proposed regulations until he reads them. “We don’t have one shred of evidence that the MCAS is a proper evaluation tool for teachers,’’ said Gosnell, but he added that the federation does support rigorous evaluations. Thomas Scott, executive director of the Massachusetts Association of School Superintendents, said the state might be better off getting legislative approval for some of the most stringent aspects of the evaluation system, such as terminating employees who fail to make progress under the one-year improvement plans. But Chester said he believes the state board has the authority to execute the evaluation system through new regulations. Although state law requires school districts to negotiate evaluation procedures with unions, it also stipulates that any resulting system be consistent with state regulations, Chester said. 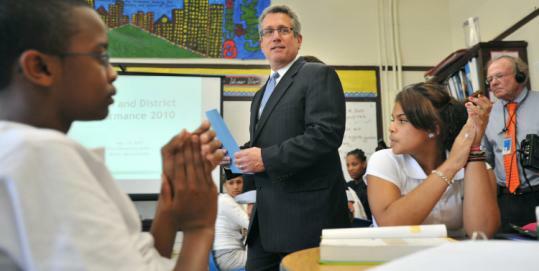 Districts that fail to comply could face state sanctions, such as a loss of funding, or legal action, he said. Making MCAS scores and other data central in evaluations would represent a monumental shift in Massachusetts in judging educator performance. The state’s current regulations merely encourage districts to include testing results in teacher evaluations, but few districts actually consider the data if they even do evaluations, state officials have said. Massachusetts committed itself to developing a new teacher evaluation system based on student achievement data in its application for a grant from Race to the Top, the Obama administration’s competitive school overhaul program. The state ultimately secured $250 million last summer, some of which will help local districts implement evaluation changes. A fiery debate subsequently emerged over how much weight testing data should have in determining the overall effectiveness of a teacher or administrator. The Massachusetts Business Alliance for Education and other education-advocacy organizations wanted MCAS scores and other testing data to make up at least 50 percent of an evaluation, an approach adopted by Colorado, Tennessee, and other states. A state task force, in a series of recommendations last month, said only that such data should have a significant role in evaluations, but was somewhat vague on how much. Chester said he decided against setting a specific percentage, believing it would be arbitrary and not based on research. He did, however, adopt a number of the task force’s recommendations, many of which were similar to those pitched by the Massachusetts Teachers Association. Across the state, evaluation of teachers and administrators is often sporadic, going well beyond the two-year period set by the state. The evaluation forms themselves are considered inadequate by educators and state officials alike, providing just two categories to rate performance, satisfactory or unsatisfactory. A report last year by the National Council on Teacher Quality, a nonpartisan research and policy organization in Washington, D.C., revealed that about half the teachers in Boston had not been evaluated in at least two years, and those who were rarely received an unsatisfactory designation. Boston principals have said privately that they prefer to push out subpar teachers with little fanfare, rather than rate them as unsatisfactory and make them less attractive to principals at other schools. Administrators say union rules make it too difficult to fire teachers, although union leaders say the provisions ensure due process. Under the proposed regulations, districts would have to develop a rating system for teachers and administrators that includes at least four performance desingations that could range from “exemplary’’ to “unsatisfactory.’’ In addition to student testing data, the person conducting the reviews would also consider classroom observations and other measures to determine a rating. It is possible, under the system, that an educator whose students show lackluster achievement could be rated as proficient, if the reviewer believes the educator demonstrates strong skills. But such a conclusion would have to be verified by a third party, such as the superintendent. Even music, physical education, and art teachers would be subject to the regulations, requiring districts to develop some way to measure student achievement growth in those subjects. The goal of evaluations, Chester said, is to improve educator performance. This should not be viewed as a punitive or “gotcha’’ exercise, he said. The proposed regulations also would raise the bar for provisional teachers to reach “professional status,’’ a designation that provides them with job protections. Teachers would have to rate proficient in all evaluation areas. That recommendation pleased the business alliance, which is anxious to review the commissioner’s proposed regulations to see if his emphasis on student data would be consistent with the organization’s proposed 50 percent threshold. “Students stand to have a better chance of succeeding if they have an effective teacher every day,’’ said Linda Noonan, the alliance’s executive director.